Someone I know just got back from a trip to Turkey. I heard about the sense of history at the site of Troy. It is in Anatolia. That area used to be called Asia Minor. And I was given a souvenir. A lucky charm. It is supposed to protect me against the evil eye. The evil eye is a curse or harmful wish. So it is not really a good luck charm. It's to protect me against evil specifically directed at me. In Japan an amulet or lucky charm is called an omamori おまもり お守り. You can get them at shrines and temples. Some of them are also for specific kinds of protection. Against harm on a journey, or for protection during pregnancy, or for help for exams, say. 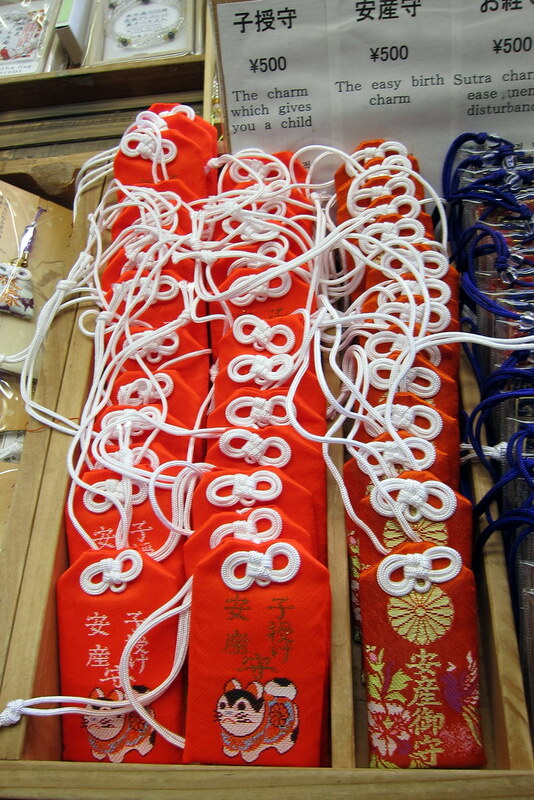 Many martial artists and sports players have an omamori on their equipment bags to protect against injury. In English we say "good luck" to people who are doing an exam or playing in a sports match. So we are saying that we hope some higher power will look kindly on them. In Japanese they say "gambatte!" Do your best! or fight! or try your hardest! So they are saying: Don't rely on a higher power. Do the work yourself. Train hard. Prepare well. Succeed by your own ability and your own efforts. Maybe that is a more effective approach. A strange thing happened that day. My friend had told me that the best food in Turkey was pomegranates. Then later the same evening someone else I know told me that while he was clearing out some old things he had found a book that he had bought in Kochi many years ago. It was a bilingual edition of some short stories by William Saroyan. He told me the story that he had always remembered was The Pomegranate Trees. Wow, pomegranates twice in one day. In Japanese pomegranate is zakuro ざくろ, 柘榴 or 石榴 or 若榴. 8 Responses to "luck and pomegranates"
That rake is called a kumade - that's kuma + te a bear paw - because of its shape. I couldn't find anything about it on wikipedia except this interesting background on Shinto. That article (at the end) says it's to attract good business but I believe it's also to gather all the good luck together. In a way it's the opposite of a dream catcher catching bad dreams. It only collects good luck. Hi Daian. A few years ago there was a noni boom in Japan. It was over-hyped. But a friend recommended it after I injured my knee. I found it really helped speed the healing process. I haven't drunk it since then but I recommend it highly for injuries. Carina pomegranate comes from Latin pomum apple granatum with many seeds. Have a good time in Granada. Pomegranate juice has become popular in the supermarkets, not just health food stores. When eating them,we have to be careful of our clothes. One of my students was working for the State Dept and ended up marrying someone from Turkey. Unfortunately I lost her address years ago and her parents moved. Hopefully I will meet them again somehow. Not exactly omamori, but have you heard of kumate, the tiny rakes they sell at a fall festival somewhere near Aikikai Hombu? Thank you Francis. I didn't know about Branch Rickey. I found out that as well as Jackie Robinson he drafted Roberto Clemente. That's a cool legacy. Then I saw he also led the Cardinals to their first World Series championship. So it's nice to remember him in the week they won their eleventh. Hi Niall. Your anecdotal stories of Japanese culture continues to bear delicious fruit for the rest of us to enjoy. Calls to mind the words of the great Dodger GM, Branch Rickey, that "luck is the residue of design.". Wonder what he envisioned with the introduction of Jackie Robinson to Major League Baseball, and how lucky the grand old game, and us, have been because of it. Thank you Carina. Another coincidence. I opened my newspaper today (29 October) and it was Turkey's national day. Wow. An article from the Turkish ambassador says that relations began when a Turkish frigate was wrecked in Wakayama. That's where O Sensei was from. This week Turkey had its own earthquake tragedy. Thanks Niall, I heard omamori the first time from colleagues in ninjutsu, when they went to Japan to visit their Soke in Noda Shi they brought them as amulet. Pomegranates are used to attract luck too And Shakespeare mentioned it in Romeo and Juliet Nightly she sings on yon pomegranate tree. Believe me, love, it was the nightingale.